Researchers identify an essential protein that helps enzymes relax overtwisted DNA so each strand can be copied during cell division. DNA is a lengthy molecule — approximately 1,000-fold longer than the cell in which it resides — so it can’t be jammed in haphazardly. Rather, it must be neatly organized so proteins involved in critical processes can access the information contained in its nucleotide bases. Think of the double helix like a pair of shoe laces twisted together, coiled upon themselves again and again to make the molecule even more compact. Postdoc Monica Guo ’07 and former graduate student Diane Haakonsen PhD ’16 are co-first authors of the study, which appeared online in the journal Cell on Sept. 13. Although it’s well established that topoisomerases are crucial to DNA replication, it has now becoming clear that we know relatively little about the mechanisms regulating their activity, including where and when they act to relieve supercoiling. These enzymes fall into two groups, type I and type II, depending on how many strands of DNA they cut. The researchers focused on type II topoisomerases found in a common species of freshwater bacteria, Caulobacter crescentus. Type II topoisomerases in bacteria are of particular interest because a number of antibiotics target them in order to prevent DNA replication, treating a wide variety of microbial infections, including tuberculosis. Without topoisomerases, the bacteria can’t grow. Since these bacterial enzymes are unique, poisons directed at them won’t harm human topoisomerases. Such findings hinted that there might be similar interactions taking place in other organisms. In order to understand the protein factors involved in compacting Caulobacter DNA — regulating topoisomerase activity specifically — the researchers screened their bacteria for proteins that bound tightly to supercoiled DNA. From there, they honed in on one protein, GapR, which they observed was essential for DNA replication. In bacteria missing GapR, the DNA became overtwisted, replication slowed, and the bacteria eventually died. 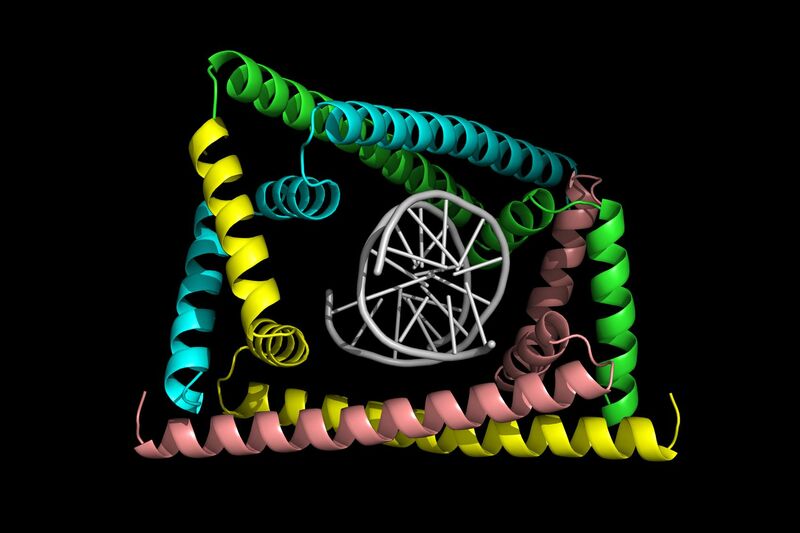 The crystal structure of the protein bound to DNA, solved by Duke’s Maria Schumacher, revealed that GapR recognizes the backbone of DNA (rather than the bases), forming a snug clamp that encircles the overtwisted DNA. However, when the DNA is relaxed in its standard form, it no longer fits inside the clamp. This might signify that GapR sits on DNA only at positions where topoisomerase is needed. Although GapR appears to be required for DNA replication, it’s still not clear precisely how this protein promotes topoisomerase function to relieve supercoiling. According to Guo, the study provides insight into a fundamental process — DNA replication — and the ways topoisomerases are regulated, which could extend to eukaryotes. The research was funded by NIH grants, the HHMI International Predoctoral Fellowship, and the Jane Coffin Childs Memorial Fellowship.